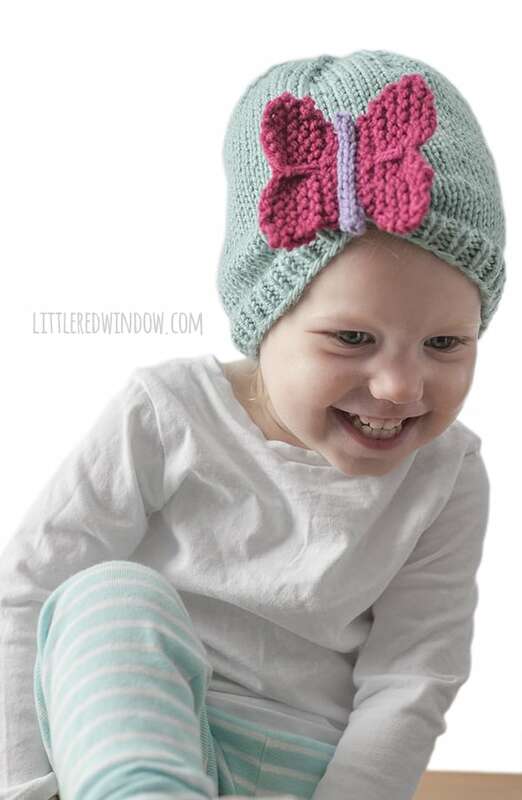 This adorable gathered butterfly hat knitting pattern is the cutest spring or summer baby hat you can make! 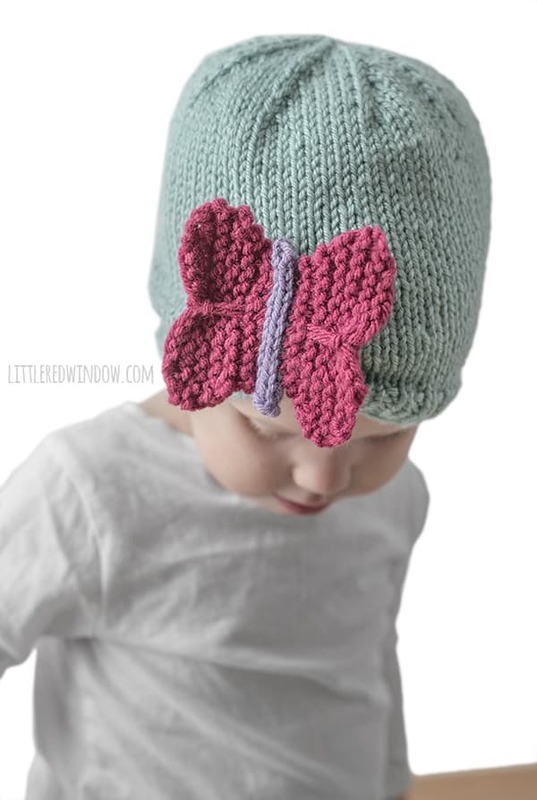 Your little one will be the cutest butterfly in the garden! I have wanted to make a butterfly hat forever, you guys! But I was drawing a total blank on how I wanted it to look. And I couldn’t wrap my head around the construction of the butterfly wings because I knew I wanted them to be easy to make and not super fiddly and frustrating. The weekend I made this hat, I had one of those days where NOTHING I did came out right or how I imagined and I had to keep redoing things and I was super frustrated. And then the next day, it was complete opposite. I woke up, I sat down and envisioned these butterfly wings, and they came out perfectly on the first try. Boy, do I wish designing always worked like that! Anyway, while this butterfly hat caused me some stress, it won’t cause YOU any stress because it’s really super easy to make. No fancy stitches, too many needles, or millions of ends to weave in. Honestly, they’re super easy and so cute! 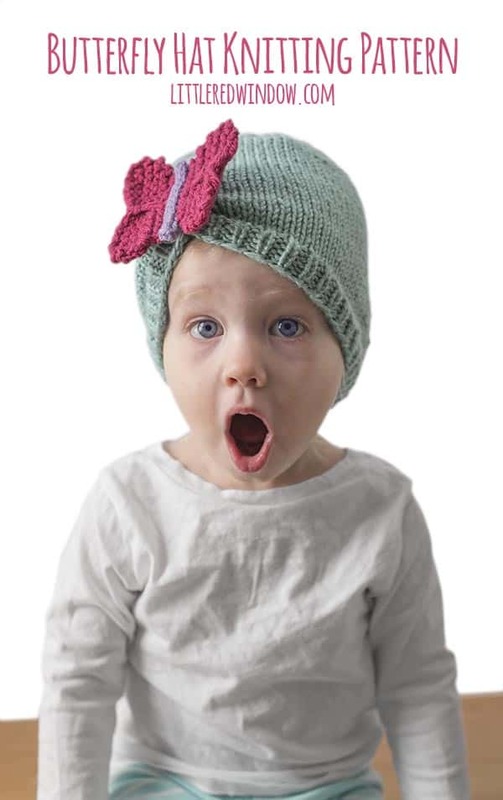 I would love it if you make your own butterfly hat, go on over and share it on Ravelry, those projects linked to my patterns really help, friends! Looking for the pattern? Here's how it works: This pattern is available for free in one size right here on my site (keep scrolling down). Or you can purchase an upgraded PDF pattern that is ad-free and easy to print in just one or two nicely formatted pages. 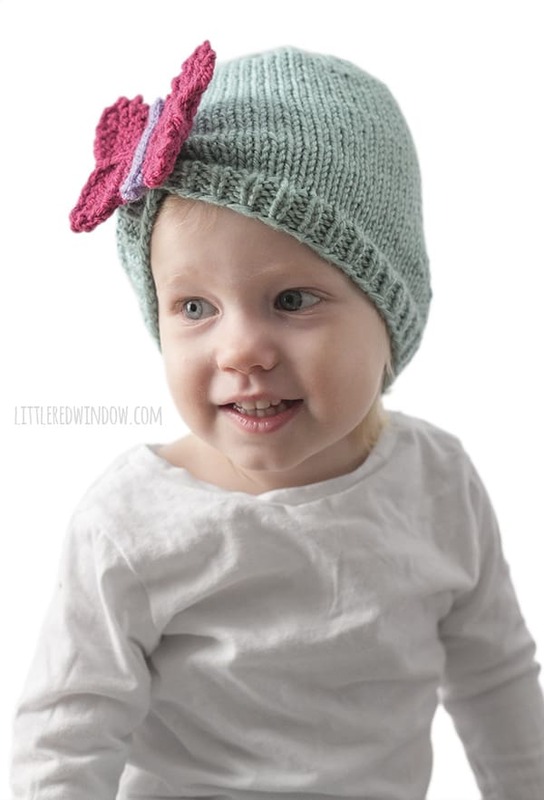 The PDF printable also contains instructions for additional sizes including 0-3 months, 6 months, 12 months and 2T+! 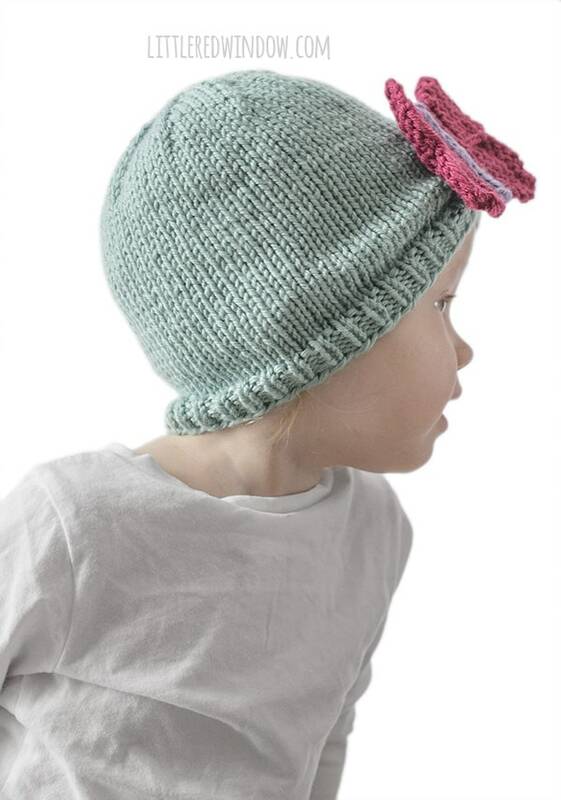 You can purchase the PDF patterns either via Etsy or Ravelry. 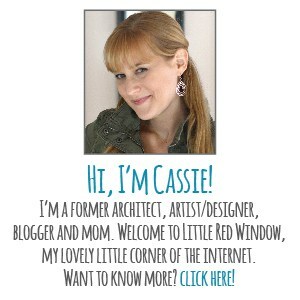 There is a very small fee for the PDF version and this helps me keep Little Red Window running! Thank you so much for loving my patterns! This pattern is copyright Little Red Window Design 2017 and is intended for personal use. You may not not distribute, reproduce or sell this pattern either physically or digitally. Using long-tail cast on, cast on 72 stitches onto your circular needles with the blue yarn. Join to knit in the round. Finally knit all stitches until the hat is about 5 inches long. Cut yarn, thread through loops and pull to close. Weave in ends. Using long-tail cast on and double pointed needles as straight needles, cast on 11 stitches with the pink yarn. Bind off and weave in cast on end only. 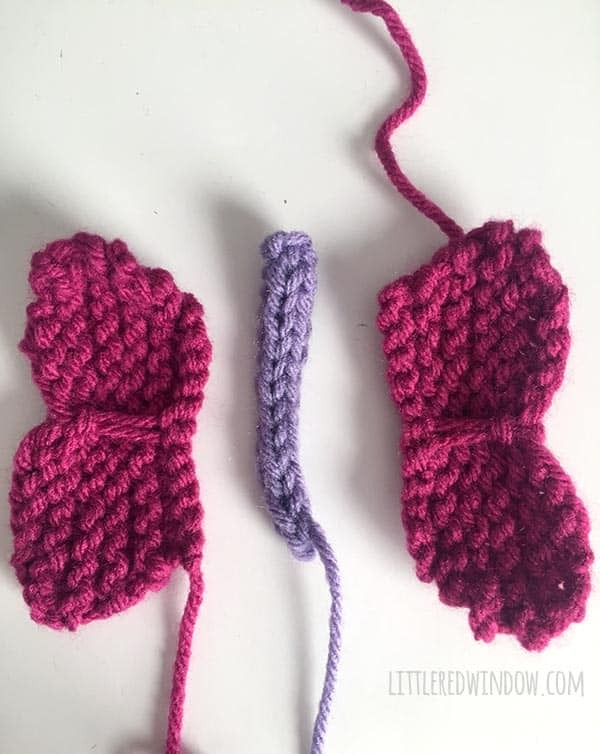 Leave a long cast off tail to sew the butterfly together. 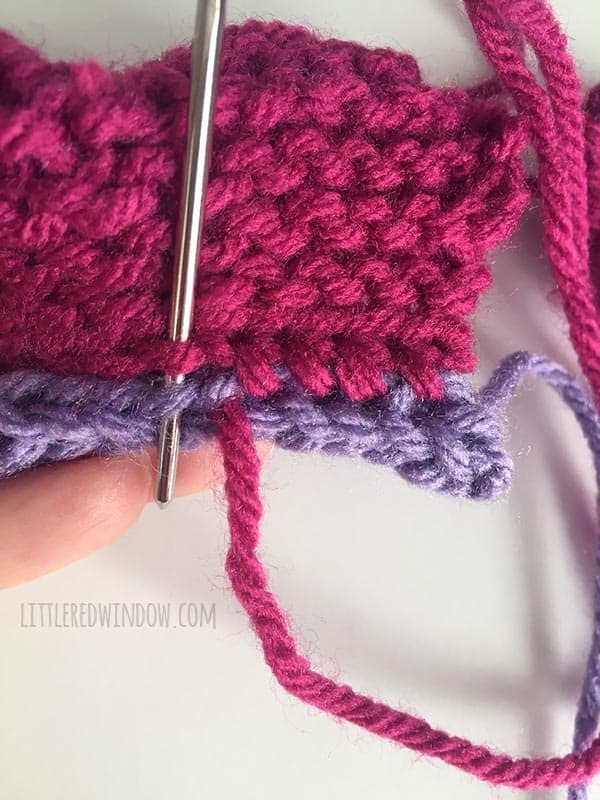 Using your double pointed needles cast on 3 stitches with purple yarn and knit an icord for 12 rows. Then bind off and weave in that end. Thread the cast off tail of one wing on a yarn needle and stitch it to the side of the icord body, hiding the stitches on the back side. Repeat with other wing. 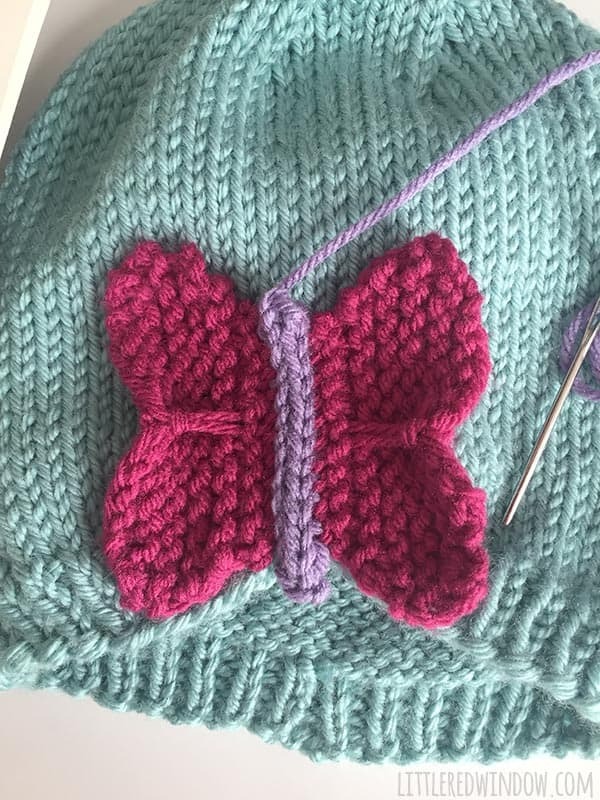 Then use the cast on tail from the icord body, threaded on a yarn needle, to gather the hat at the slip stitch and stitch the butterfly securely to the hat. And that’s it! Enjoy your beautiful butterfly hat!